In the morning when the sun is in the east, the grass and goldenrod fades into the underbrush and goes unnoticed, but it's there. But in the evenings as the sun "lazes" toward the western horizon, the light plays on the grass and transforms it into something that's hard to ignore. One morning last week, my nephew was doing some bush hog work on his fields that adjoin our property, and he offered to mow down the grass at the edge of my garden. I thought about it for a moment, and then declined. After, it became the subject of several photographs, and this blog entry. Maybe it's not such an intruder after all. Lovely snapshot, Rick. If I had time to paint with pastels I would use it as a source of inspiration. 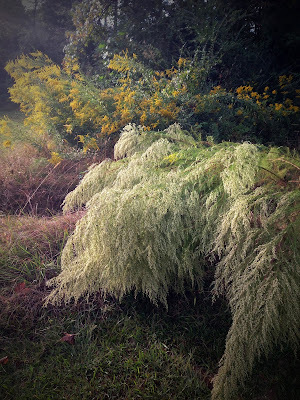 I love Goldenrod but the long grass... I'd mow it down.